Once a major mainstay of commerce and community in the East Williamsburg neighborhood of Brooklyn, the Moore Street Market had trouble maintaining full vendor occupancy in modern day New York. Congresswoman Nydia M. Velázquez, concerned about the threat of closure, contacted PPS to help revitalize the unique cultural and economic resource. In order to analyze the market’s current situation and prepare a comprehensive management plan, PPS worked extensively with the City University of New York (CUNY) to create a social and historical study of the market, and with Bay Area Economics to develop an impact study concerning its current and potential economic impact. Additionally, PPS also studied the buying power of the neighborhood as a whole, concluding that the geographic area held a great deal of economic potential from a diverse local population. 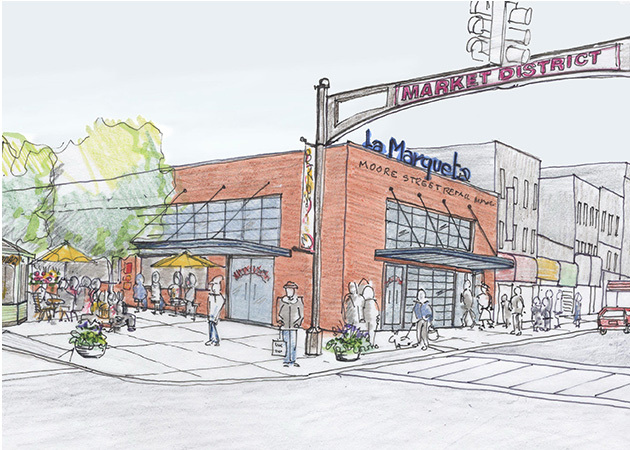 To involve the community in the visioning and planning for the market, PPS created an Advisory Group, consisting of local politicians, market vendors, the local Business Improvement District, and neighbors of the market. PPS also hosted a Placemaking workshop where more than 100 local residents provided feedback on the product and activity mix they’d like to see at the market in the future. Based on these results, along with an economic analysis, PPS produced both short-and long-term management plans for the market. To build revenue for the market and to reintroduce the market up to a wider audience, PPS recommended a new lay-out for the market, which included more stalls and turning the market “inside-out” through the creation of a 7,000 square foot public plaza. To take the lessons from Moore Street nationally, PPS developed and produced a vendor handbook, designed to help minority vendors start their own small business at a public market. The handbook is available on PPS’s website in both English and Spanish.